Pleasant View Ridge would include a working farm, pictured above. The Middleton City Council last week got its first glimpse of a development proposal that would transform 162 acres of rural land between U.S. Highway 14 and Pleasant View Golf Course into an assortment of residential neighborhoods situated around a working farm. 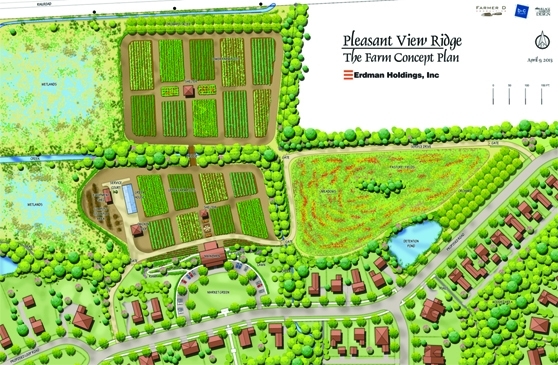 Erdman Holdings, Inc. submitted early-stage conceptual plans for the project, which is being called Pleasant View Ridge. The developer indicated it needs feedback from city leaders before returning with a more refined proposal. Planning documents show Pleasant View Ridge containing 104 home sites on lots both large and small. About half of the homes would be on parcels of about 6,500 square feet and would utilize community septic. The larger home sites, occupying about 20,000 square feet, would use individual septic systems. Proponents of community and individual septic systems (as opposed to urban utilities) say are environmentally friendly because they help recharge groundwater. The developer hopes to break ground in 2014 and complete the project by the end of 2019. Erdman is best known in the Good Neighbor City as the developer behind Middleton Hills, an exercise in new urbanism. “Building on the principles and practices of new urbanism, Pleasant View Ridge will have the features of new ruralism which, as defined by the Urban Land Institute, combines the development of livable communities with the preservation of a community’s rural character, often through sustainable agricultural practices and clustered home sites,” Grabowski-Miller wrote. In a subsequent interview with the Times-Tribune, Grabowski-Miller went on to say the philosophy is intended to work as an antidote to urban sprawl. She said the project would place an emphasis on “outdoor enjoyment” and include walking trails and ample parkland. It would be adjacent to the City of Middleton’s Pleasant View Golf Course, which doubles as a cross-country skiing destination in the winter months. The proposal contains an option for lots situated on the golf course. The land where Erdman hopes to build is currently zoned for agricultural use. It’s owned by the developer and located in the Town of Middleton. While the likelihood of multiple new high voltage transmission lines crossing the Town of Middleton has many residents there concerned, Grabowski-Miller said the lines would probably run along the border of Pleasant View Golf Course or inside the easement along Highway 14, not through the residential neighborhoods being proposed. Supporters of Pleasant View Ridge said the farm would serve as a cultural hub for the surrounding single-family units. Joffe described agriculture as a form of amenity. “It’s kind of the new golf,” he stated. Planning documents show the farm at Pleasant View Ridge occupying between five and 10 acres. The developer’s financial backing would assure that agriculture stayed part of the land, Joffe asserted. Joffe said the project being drawn up would “attract a very dynamic group of people” to the residential portions of the development. Grabowski-Miller said she hopes other city leaders embrace the project in the same manner.